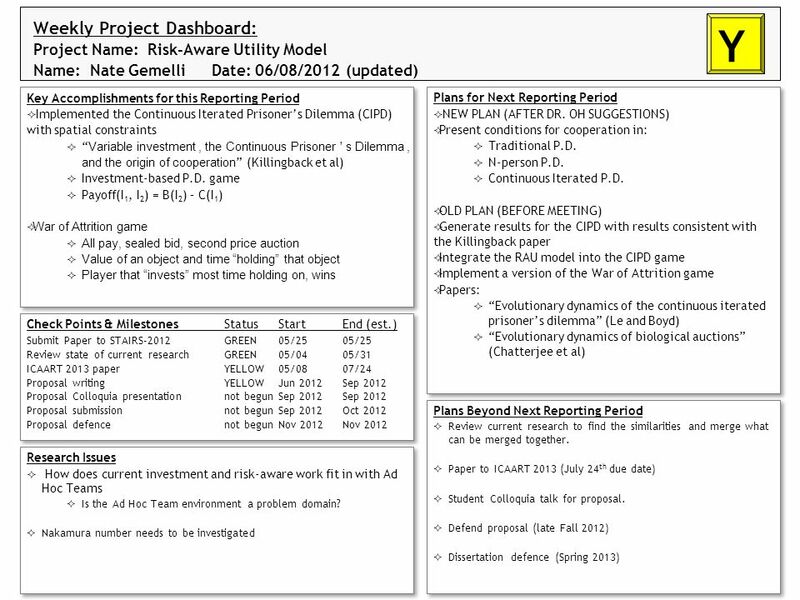 Weekly Project Dashboard: Project Name: Risk-Aware Utility Model Name: Nate GemelliDate: 06/08/2012 (updated) Y Key Accomplishments for this Reporting. Download ppt "Weekly Project Dashboard: Project Name: Risk-Aware Utility Model Name: Nate GemelliDate: 06/08/2012 (updated) Y Key Accomplishments for this Reporting." New for 2013 SF-SAC Items Page 1 - Auditors Required to Report EIN Page 3 - Designation for Federal Loans and Loan Guarantees Page 4 – Standardized Finding. The ADQ Adventures of LFV by Roger Li, Group Manager AIM 28th of May, Brussels. AD/AB - LCCA 2 nd Session Wednesday, January 29th. Social Networks 101 P ROF. J ASON H ARTLINE AND P ROF. N ICOLE I MMORLICA. Heterogeneous Payoffs and Social Diversity in the Spatial Prisoner’s Dilemma game Dept Computer Science and Software Engineering Golriz Rezaei Dr. Michael. Evolving Cooperation in the N-player Prisoner's Dilemma: A Social Network Model Dept Computer Science and Software Engineering Golriz Rezaei Michael Kirley. P ROJECT S TATUS S UMMARY. Insert Date Presentation Title Goes Here Sample Project Status/Schedule Summaries In addition to managing a project plan in. Diversity Task Force Equity and Excellence Recruitment and Retention Cultural Awareness and Training Goals for Subcommittees. Warrington March 2012 Dr Paul Blantern Chief Executive – NCC MD - LGSS LGC Future Leaders Network. Multiagent Coordination Using a Distributed Combinatorial Auction Jose M. Vidal University of South Carolina AAAI Workshop on Auction Mechanisms for Robot. ETH 316 Week 3 Individual Organizational Issues Check this A+ tutorial guideline at 316-Week-3-Individual-Organizational-Issues.